In February 1917 - six months before his 19th birthday - Ernie Dingwall volunteered to fight for his king and country in World War 1. A slightly-built, fair-haired young man who was working as a shipping clerk and living with his parents in Melbourne’s inner-east, he was also a pacy wingman for VFA club Prahran. After basic training in Australia, Dingwall embarked for France with the 9th draft of reinforcements for the 60th Battalion in July of 1917. He was sent into the front line trenches in January 1918, as the Allied forces (heavily reinforced by the arrival of American troops) began to push the German army back toward its own borders. In March, amid some of the heaviest fighting of the war, Dingwall suffered a serious bullet wound to his left hand, and was evacuated to hospital. At a subsequent enquiry he was charged with negligent handling of a firearm, found guilty, and sentenced to 28 days of field punishment. When the war ended at last in November 1918, he was still undergoing treatment. Back in Australia six months later, Dingwall was discharged as medically unfit. 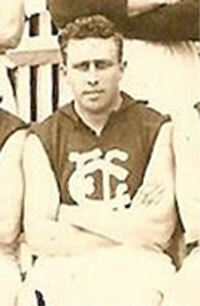 Like many former soldiers, he resumed his pre-war job, and eventually pulled his football boots on again for Prahran. By the summer of 1920, Ernie’s hand had fully healed at last, and his form for the Two Blues during the following season caught the eye of Carlton’s scouts. He was invited to train at Princes Park and did well enough in the 1922 pre-season trials to be selected on a wing for his debut match in round 2, against Fitzroy in May. Playing alongside Billy Blackman and Newton Chandler across the centre, Dingwall's tenacity impressed coach Norman Clark and from then on, he held his place in the team right through the next six rounds. But he kicked his only career goal from a half-forward flank against Melbourne in round 4, and in the end, it was his inability to capitalise on his chances close to goal that told against him. He was left out of the side that played Essendon in round 10, then was recalled for the return match against Fitzroy in late July. Sometime after coming off the ground that day, on the end of an 18 point loss to the Maroons, Ernie Dingwall decided that his career at Carlton was over. He handed back his number 24 guernsey, and faded from view. Dingwall was born in Albert Park, he passed away in 1963 aged 65. Contributors to this page: molsey , Bombasheldon , PatsFitztrick , tmd1 , Jarusa , true_blue24 and admin . Page last modified on Tuesday 08 of May, 2012 19:55:30 AEST by molsey.